I’m interrupting my holiday posts to bring you this recipe that I cobbled together created 🙂 last night. 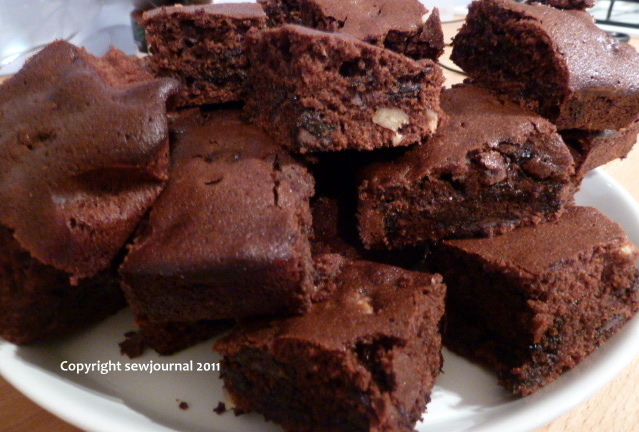 My friend Sylvia made brownies for me while I was in NY state and I really enjoyed them. I fancied some last night but didn’t have a recipe. I trawled the internet and read several recipes then I took the barebones, changed them to make them less naughty and to accommodate the ingredients that I had in the cupboard and added some flourishes to the method. My husband thinks they are the “best he’s ever had”, so that’s quite an endorsement. These brownies don’t use butter. I used a mix of Macadamia Oil and Flora Proactive Buttery (Cholesterol lowering margarine) and I substituted Splenda for half of the sugar. Put the cocoa, the bicarb soda and Macadamia oil in a large bowl and blend well. Add the boiling water and stir well. Stir the sugar and Splenda into the cocoa/oil mixture then add the beaten yolks and mix well. Fold in the the beaten whites. Add the 1/3 cup Flora and whisk gently with a balloon whisk. You’ll find it blends very easily. Stir in the plain flour and salt. (You can sift the flour if you want to but I didn’t bother.) Fold in the nuts and the chocolate chips and stir to distribute through the batter. Pour the batter into a baking tin lined with baking paper. My tin was too large (14 x10inches) so I folded up the baking paper at one end and kept it in place with another small baking tin. I guess you need a tin that’s roughly 11″ square – you’ll have to experiment like I did. Bake at 160 deg C for 35 to 40 minutes (150 deg C if you have a fan forced oven) or until the brownies spring back when touched and begin to pull away from the sides of pan. Cool in the tin before removing and cutting into squares. If you make them please let me know how you go.